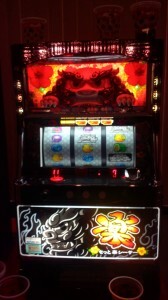 A slot machine (American English), informally fruit machine (British English), puggy (Scottish English slang), the slots (Canadian and American English), poker machine (or pokies in slang) (Australian English and New Zealand English) or simply slot (American English), is a casino gambling machine with three or more reels which spin when a button is pushed. Slot machines are also known as one-armed bandits because they were originally operated by one lever on the side of the machine as opposed to a button on the front panel, and because of their ability to leave the gamer impoverished. Many modern machines are still equipped with a legacy lever in addition to the button. A gambler strategically operating multiple machines in order to draw the highest possible profits is called a multi-armed bandit. Slot machines include a currency detector that validates the money inserted to play. The machine pays off based on patterns of symbols visible on the front of the machine when it stops. Modern computer technology has resulted in variations on the slot machine concept. Slot machines are the most popular gambling method in casinos and constitute about 70 percent of the average US casino’s income.